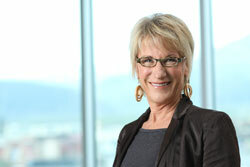 Carol moved to Park City in the early 1980s, and embarked on her real estate career just as a mid-80s slump developed. Despite this, she was awarded the "Rookie of the Year" designation by the Park City Board of Realtors. Since then, her continuing diligence established her as one of the top real estate agents in Park City and Deer Valley. She has been designated the top "Sales Agent of the Year" four times, more than any other Realtor in Park City / Deer Valley. In addition, her professional success has earned her continuing recognition on the Wall Street Journalʼs list of the Top 100 Agents in the Country. Carol has served as President of the Park City Board of Realtors, and is currently Chairperson of the Statistics Committee. Her extensive experience coupled with her grasp of detail, sets her apart from other Realtors -- Carol is a virtual walking encyclopedia of Park City and Deer Valley real estate knowledge. To provide augmented professional service; to make your real estate transactions run smoothly, Carol engages experienced, fully-licensed, full-time Realtor associates. Whereas some agents employ "assistants", Carol's office group comprises bona-fide professional agent-associates.